Piano/Bass/Drums – a classic jazz trio format. 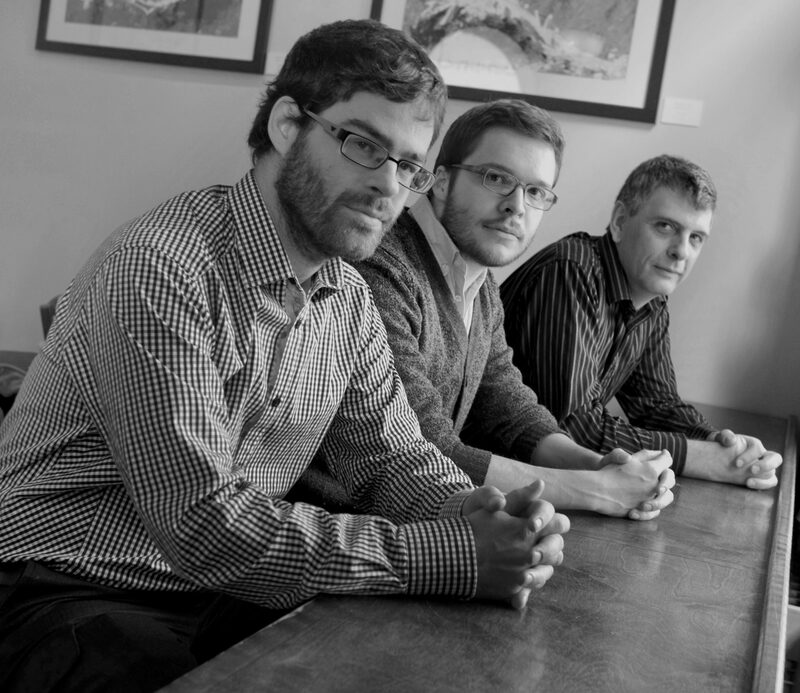 This trio is original music penned by Thomas, Tyler, and Dave. In the mix are tunes by Radiohead, the Beatles, Tears for Fears, Genesis, Tom Waits, and favourite songs from the massive ‘standards’ catalogue. Thomas Hammerton has been playing professionally since the age of 15. He is a graduate of the Humber College Music Program where he studied with pianists Bernie Senensky and Hilario Duran. Thomas is an in demand and versatile pianist performing with various acts; Odd Years, Joni Nehrita, The Minotaurs, Jason Raso, Bry Webb,and Cuff the Duke. Thomas has had the pleasure of sharing the stage with Randy Bachman, Jim Cuddy, Greg Keelor, Hayden and Nikki Yanofsky. His career has led him around the world performing and recording in all genres of music. Thomas lives in Guelph, ON. Tyler Wagler is an in demand bassist as a performer and educator as his musical pursuits are diverse. He is at home in jazz, the blues, performing with gospel/folk singer David Sereda, roots reggae band Friendlyness & The Human Rights, Paul Quarrington, and Jay Douglas and The Legendary Platters. In 2011, Tyler released his own CD as a singer/songwriter. Tyler is a graduate of Humber College where he studied bass with Don Thompson, Mike Downes and Pat Kilbride, and holds a Bachelor of Music from Thompson Rivers University. After several years of teaching and performing professionally in Toronto, Tyler now lives in Guelph, ON. Dave O’Neill is a performer and educator of all things musical. He has toured Eastern Canada, parts of the U.S., performed at numerous venues, music festivals, theatre productions, conducted clinics and workshops, and has extensive experience in the recording studio. Dave has taught privately for the last twenty-eight years, spent four years on the part time music faculty at Mohawk College, and is a supply teacher for the Waterloo Region District School Board. He is endorsed by Headhunters Drumsticks. Dave holds B. Ed. and a B. Mus. Perf. from the University of Toronto, as well as a Dipl.Mus. from Mohawk College. He has studied with drummers Bob McLaren, Barry Elmes, Ernie Porthouse, John Cheeseman, and Memo Acevedo. Dave lives in Cambridge, ON.